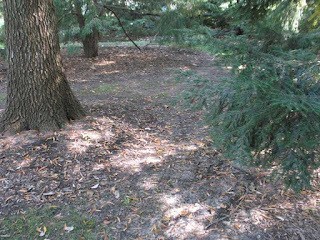 One of the common complaints we hear in the lawn care and landscaping business in the Boise, Idaho area is the difficulty of growing grass underneath the trees. This has a lot to do with the type of grass, the amount of shade, and the condition of the soil as well as the root system. There are some grasses that do better than others, at Organic Solutions, Inc., we can help you find a grass that will work for your particular situation or if you are tired of trying to mow or trim underneath your tree(s), there are some alternatives to grass or bare ground that make an attractive solution. One option is to find a groundcover to replace the grass under your tree. 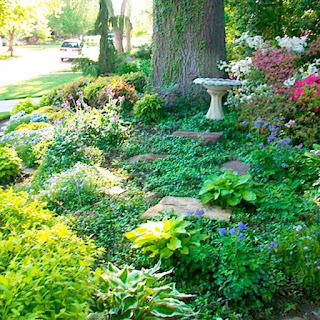 You have to be careful when choosing a groundcover, making sure that it does well in the shade and soil conditions. You also need to consider how aggressive the ground cover is and if you need to contain it in a formal garden bed. Using plants and/or mulch around the base of a tree can benefit the tree if done correctly and be pleasing to the eye as well. 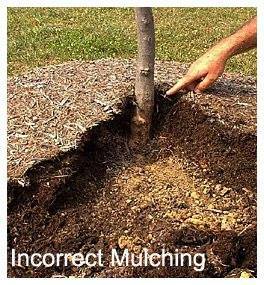 If you decide to mulch you should not go deeper than 2-3 inches and make sure that the mulch does not actually touch the base of the tree. 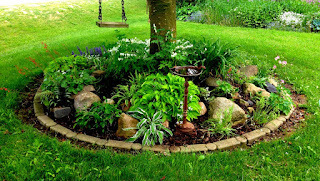 Mulching or using a ground cover are easy options but maybe not as interesting as adding plants and flowers. 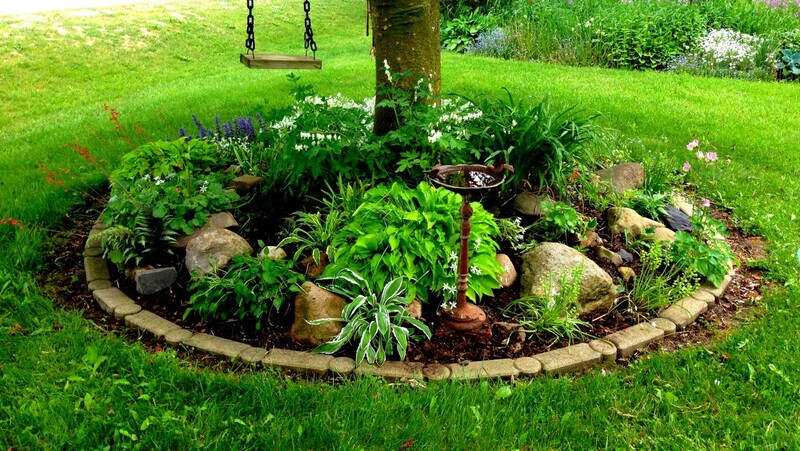 If you decide that you want to a focal point around the base of your tree by adding plantings, there are some things to consider. One should always be cautious about planting around mature trees to avoid damage to the root system. Some trees are more sensitive to root and soil disturbance than others. For example a beech or a dogwood is less tolerant than a poplar or a crabapple. You many need to do some research on your particular tree before you decide what to plant and how. You may need to trim the lower branches before planting, not only to make it easier to work in that area but also to provide more sunlight, even shade tolerant plants need some sunlight. One of the mistakes many people make when deciding to plant a garden beneath a tree is to build up the soil and make a raised bed. This change in soil depth can be detrimental to a tree. It is better to disturb the soil only where you are planting. When considering the type of plant or flower, make sure that it won’t grow too tall or spread out too much. It is recommended that you purchase the smallest size of the plant you are choosing so that you only need a small hole to plant it in. This makes it easier to tuck the plants in between the roots. You will most likely have to sever some small roots to plant but if the root is larger than 1 ½ inches in diameter it is best to leave it and dig beside it. To avoid damaging the trunk, plant at least 12 inches away. You can fill the hole in with some organic matter. After you have installed the plants, water the entire area to allow for settling. Then you can spread mulch over the area if you would like, no more than 3 inches deep. Once your chosen plants are in the ground they will need some care as they will be competing with the tree for nutrients and water. You will need to water weekly unless you have a lot of rain and you may need to spot water if the tree seems to be absorbing all the moisture. You should avoid fertilizer the first year so that the roots of the new plantings will develop, especially if you have chosen perennials. Adding compost or other organic matter such as manure can help replenish the nutrients and help the soil retain moisture better. Make sure to keep the depth of the organic matter under 3 inches. Planting with these cautions in mind, you will soon have a shade garden that is beautiful to behold as well as beneficial to the tree. At Organic Solutions! Inc., we have an experienced team who can make your landscaping dreams a reality as well as provide for the care and maintenance of your landscaping and lawn. Contact us for a free estimate, by phone, 208-884-8986, or by email: organicsolutionsinc@outlook.com. Don't forget to find and follow us on Facebook! Labels: Organic Solutions! Inc was rated the #1 landscape contractor in 2015 and 2016 by Thumbtack.com!